New DLC also because we love you. The original design, before it got weaponized, was a top of the line hedge trimmer and sprinkler system. At least it wasn’t a chain driven tomato squisher. I don’t think we’re ready for a space expansion. They used it to maintain the golf course at the Heads of Houses Country Club. They first added a prototype rail gun to it in order to deal with a serious gopher infestation. It would’ve remained merely a grounds keeping tool, had His Grace Iwatani not taken his son with him to a round of golf. Details are sketchy, but the rumor is that young Taro grew bored watching his father whacking at a ball with sticks, and went exploring. He discovered the machine behind the Caddy Shack, and took it for a joy ride. What happened next is anyone’s guess, since all the eyewitnesses seem to have developed collective amnesia about that day. But the Club was closed for three months, and renovations to the Club’s buildings and grounds were funded with appropriations from the military research budget, during an emergency closed session of the Heads of Houses. Hmph. You guys are all racist against puppet-folk. I personally know a Muppet-American who makes valuable contributions to internet culture! Fourth to the last? so 3 more times? Are you saying all non-humans look alike? Given, they both wear a lot of purple and have similar hair colors and the picture is a tad close up so you can’t see the pigtails or lack there of. On a distantly related note, she’s tagged as Bandit, but last time we saw her, she was called “Commander”. I guess that was a rank or title rather than a name change. Well, she still steals. They’re examining something she stole in this strip. Shoulda known they’d have full-fledged artillery eventually. It was inevitable, since Arkerra has already seen the introduction of airships. The odd thing is it sounds like they already had artillery. They refer to it has having a predecessor. Indeed, but since the gnomes left the alliance there’s no more ammo for it. Also, the new weapon is a lot less messy. I love how you guys keep dipping into the Metal Gear references, it’s the best. metal gear? IT CAN’T BE! So who’s going to be Snake? Who’s going to be Badger? Still waiting for a giant Kenyan Mangrove Crab. You knew? That’s one of our most secret black projects! The best part is that it’s almost a progression between the avatars. The cover image has all of the races except for Avians and Landsharks. Is this forshadowing or just a sign that they didn’t have enough room the picture? YOU BE THE JUDGE! The avians are clearly flying above the battlefield, while the landsharks… um… are swimming underneath the dirt? An all-out charge and free for all is more the Landshark-style than walking in formation. I’m assuming the feet that aren’t actually touching the ground (third from last, between the dwarf and human) belong to an avian. Either that or someone’s jumping instead of marching. At least, that’s how I’m parsing it. Troll, goblin, gnoll, sky elf, wood elf, human, avian, dwarf, gnome. Oh *that’s* what that is. I spent 2 or 3 minutes trying to parse that, I thought the human was wearing a scarf or something. Ah. Didn’t notice that. Just leaves the landsharks out then. I prefer to supply my own avatars. I have several. The alt-text seems a bit off. E-Merl’s expression seems off too. Gravatar check! Because that’s what I do. 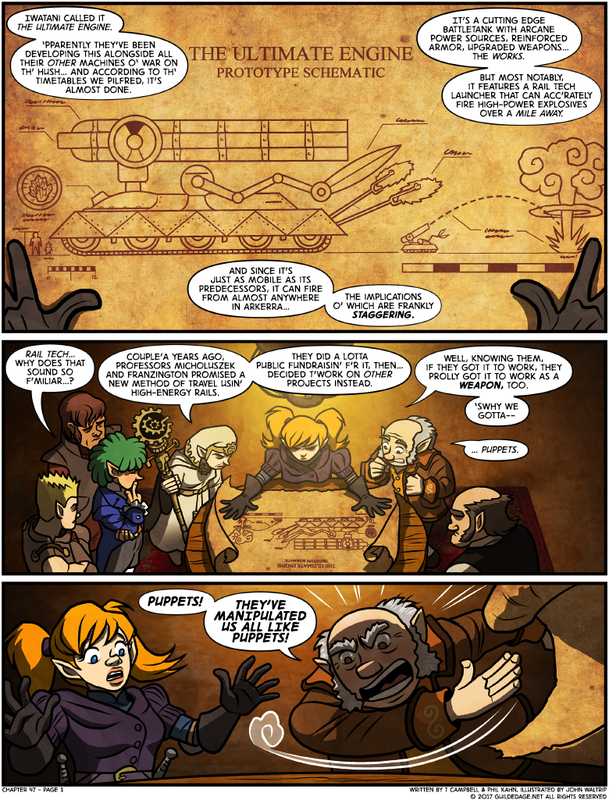 Giant scissors and sawblades…in WoW, this would be a goblin invention. Is Reynolds going to Hulk out? That’d be awesome. In hulk form he is green, stands a whopping 4.5 feet in height, and has the strength to lift 1.5x his own 90 pounds of weight. So in this regard, Hulk Gnomes are not that impressive. But, they do go into rage-fueled workoholism and can engineer for 26 hours straight before passing out, and, they’re strong enough to do almost all the relevant heavy lifting by themselves. So, the Gamma Gnome Project still well justified its cost (codename: the Gnuclear Option). Nowadays, though, that’s all obsolete. Today’s engineers just drink coffee and wolf down candy bars. The same basic effects without all the radiation problems. And now he gets it. Hmmm…. Are the orcs going to be set free? Are they going to be marching as well? The Peacemakers have frowned on the practice of orc slavery before. So I wouldn’t put it past them to try and convince Penk to let the orcs go. The avatar of my dreams?! YOU MEAN I REALLY GET…?! Sammiches, sammiches, barely any human. Sammiches, sammiches, provolone and more! I’d like to nominate you for an internet. All in favour? Because I’ve always wanted to know what my avatar would be but I’ve never commented before I’m finally doing it now. I’m not always Ardaic, but when I am, I’m one suave mofo. I don’t think it’s possible to be Ardaic and not be a suave mofo. But seriously, that gear priestess. How does an atheist cleric work? Does her faith in a mechanistic universe power glowy nonsense just as well as belief in a deity (or in oneself in Frigg’s case)? Or does her staff simply dispense hydrogen peroxide and morphine and call it a day? 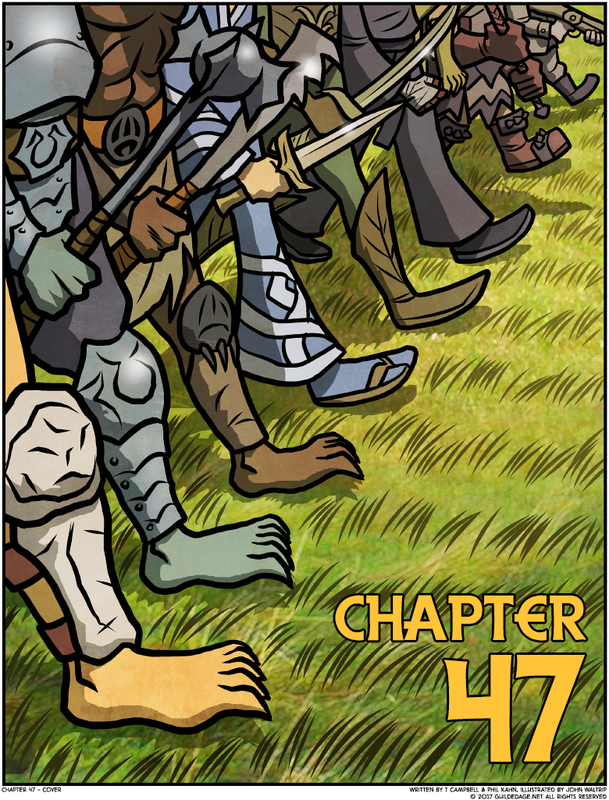 Interestingly, it looks like a High Elf is in the chapter cover page, marching alongside the rest of the Rebellion. Are all the high elves going to switch factions, or just that one? It’s time to face the music! It’s time to see the light! Would be nice to know how something like that can function just fine… yet people can’t just fly off into the sky? Maybe physics is just prejudiced in this fantasy.